Today, companies are more than ever required to design their company processes efficiently in order to stay competitive. Purchasing management is definitely one of the processes that has significant room to improve efficiency. One of the essential objectives of a purchasing department is not only to supply a company’s needs, but also to do so as smoothly and cost-effectively as possible. Traditionally, paper-based processes are relied on here with the purchase requisition – with all the disadvantages, ranging from maverick buying to a lack of transparency. Digital purchasing management avoids these stumbling blocks. Particularly with the digital purchase requisition in purchasing management: from the requisition to the solicitation of quotations to the order. EASY Electronic Purchase Requisition brings it all together. Put the pedal to the metal with EASY Electronic Purchase Requisition – and provide for more transparency and efficiency in cross-location processes and well-organized purchasing management. Our software solution for the electronic purchase requisition grants your company undreamed of in-house transparency. Follow the status of a purchase requisition with EASY Electronic Purchase Requisition, from the initial requisition to the offer to the order. Based on state-of-the-are technologies and the consistent implementation of our solution for electronic purchase requisition as a web client, EASY Electronic Purchase Requisition allows location-independent, mobile work. The purchase requisition can be accessed by smartphone or tablet with no problem. In the context of electronic purchase requirements, EASY Electronic Purchase Requisition provides the automatic compliance with internal guidelines and legal requirements – auditability is ensured. Thanks to the integrated workflow management, a variety of useful functions can be reproduced. Rule-based workflows guide the user through the entire order process of the electronic purchase order creation and provide information about the status of a digital purchase requisition, with automated transfer to all departments which are involved in the subsequent process steps. This way, a purchase requisition never gets stuck somewhere. In absences due to vacation or illness, a defined workflow provides an automated transfer of the electronic purchase requisition to previously defined substitutes. In cases of business deadlines outside of the workplace, mobile apps ensure that the flow of information is maintained. EASY Electronic Purchase Requisition is the ideal solution, not just for small to mid-sized companies. It can be implemented quickly and unites the purchase requisition with the solicitation of quotations and the orders. As a complete package and modular system – everything from a single source – it is a genuine provider of efficiency and transparency. Standardize your purchasing management right from the very beginning – in the harmonious triad of EASY Electronic Purchase Requisition: purchase requisitions, subsequent offers, and finally the order – all of that in one software package, anytime and anywhere, transparent across locations. The electronic purchase requisition provides a clean process structure. Thanks to EASY Electronic Purchase Requisition, every department involved knows about the current status of a purchase requisition, anytime and anywhere. Whether or not it has been approved, whether or not offers have come in for it., whether or not an offer has been approved for order or even if the order has been made – EASY Electronic Purchase Requisition unites it all, and at the same time makes it easy for you to keep an overview. Even on a smartphone or tablet – no matter where or when. The days of paper-based processes are finally a thing of the past with the electronic purchase requisition. Let’s get things done – because just a glance at the screen shows what the phase is. The hunt for paper purchase requisitions or purchase requests costs time – time that could certainly have been used constructively for more productive goals. Gone are the days when procurement management processes may have offered a clear structure on paper, but the familiar phenomenon of maverick buying crept into everyday business. With the electronic purchase requisition, you always have an overview of the company’s ordering behavior. And establish an ordering culture based on personal responsibility: who, when, what, and where a purchase requisition was created and orders placed remains visible for all responsible parties. Following the successful purchase requisition, it is time to solicit quotations. Here, EASY Electronic Purchase Requisition shows its full potential. Manual correspondence is out. In the context of the electronic purchase requisition, today the data is taken automatically from the purchase requisition. 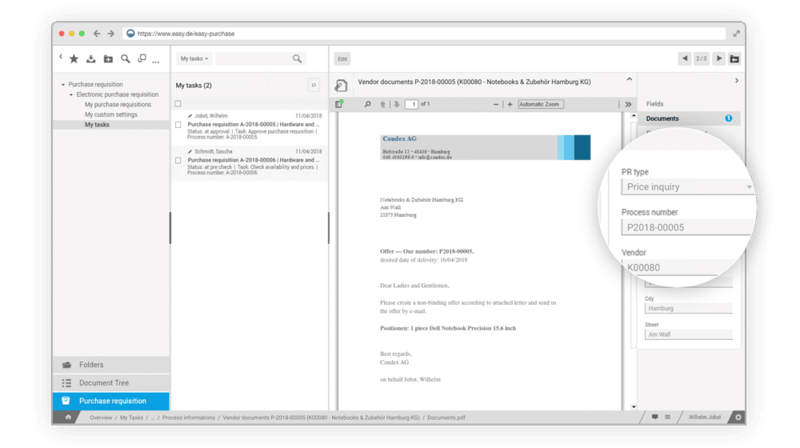 An email is quickly created with the appropriate document template and sent. The digital purchase requisition reaches the responsible positions using an electronic approval workflow. The process can take a variety of pathways, depending on the type and/or value of the goods to be approved (for example, for services, office furniture, or IT equipment). Documents and process information are created and stored in an electronic process file. A later invoice verification process can be greatly simplified if it traces back to an already approved purchase requisition and the requisition, order, and delivery information all agree. With the electronic purchase requisition, new purchase requisitions can be created via a web form. 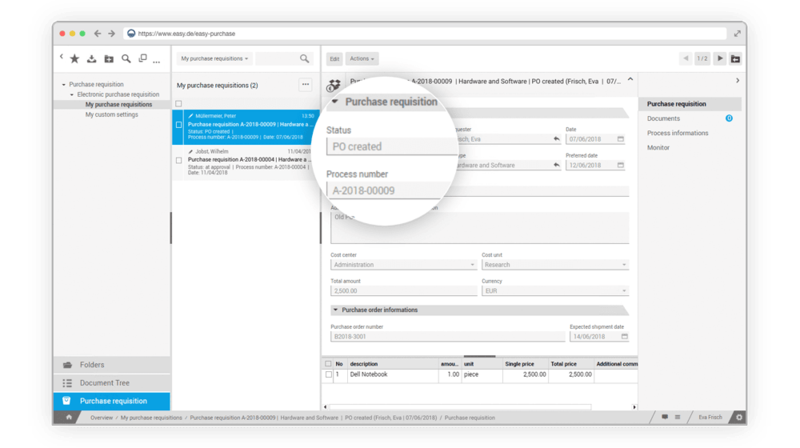 Users can access the status of their purchase requisitions at any time. The purchase requisition is guided to the responsible positions via an electronic approval workflow. Depending on the requisition type and/or the value of the purchase requisition, the process can follow a variety of pathways (for example, consumables such as printer paper, IT equipment, or even office furniture). This process information is centrally stored in an electronic process file. Based on the purchase requisition, various potential suppliers can be solicited to tender an offer. Such requests can be automated based on the data from a requisition process and created from appropriate document templates/text modules. The queries and the incoming replies can be collected in the requisition procedure, thus simplifying the documentation and the decision-making – all in one place. If an order is triggered because of a purchase requisition, this generally occurs via an ERP or merchandise management system. This procedure can take place from the electronic purchase requisition, automatically or at the touch of a button. At the same time, the former requisition file becomes an order file. With that, documents and all process information (what was requisitioned, approved, commented, etc. by whom) is available in the further process collected in one place, for example for the invoice verification or queries/complaints.